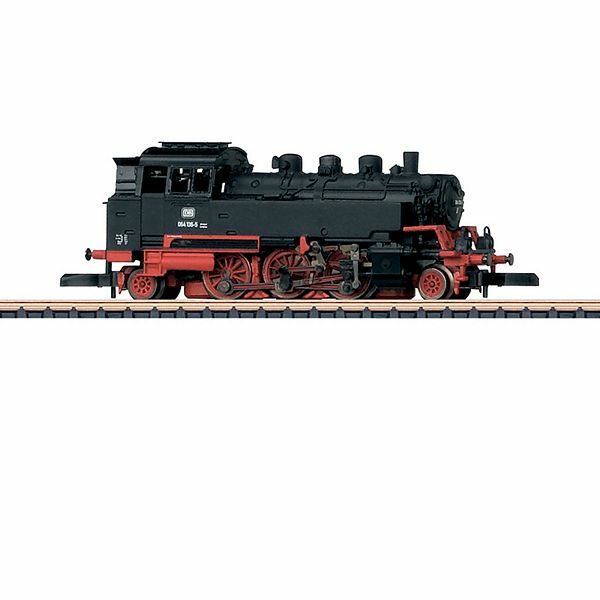 Prototype: German Federal Railroad (DB) class 064 steam tank locomotive. The locomotive looks as it did in Era IV. Model: This is a finely detailed model. The locomotive body and frame are constructed of metal. The brake rigging, rail clearance devices, etc. are modelled on the underside of the locomotive. The locomotive has finely detailed working valve gear and side rods. It also has larger buffer plates. The locomotive has welded water tanks but does not have a smoke box door central locking device or a bell. The triple headlights change over with the direction of travel. Warm white LEDs are used for the headlights. The locomotive has a motor with a bell-shaped armature. All 3 coupled axles are powered. The wheels are black nickel-plated. Length over the buffers approximately 57 mm / 2-1/4". The Class 64 - The "Bubikopf" as a Jack-of-all-Trades (almost). Between 1928 and 1940, many famous locomotive builders in Germany participated in creating the class 64. As part of the standard design program for the German State Railroad Company, the class 64 was also closely related to other locomotive classes, in particular the class 24, which supplied the boiler and the frame for the driving wheels. A total of 520 units were built of this 12.4 meter / 40 foot 8-3/16 inch long standard design passenger tank locomotive with a 2-6-2T wheel arrangement. Due to its lower axle load and maximum speed of 90 km/h / 56 mph, it could be used on almost all routes, and its successful design allowed a broad range of applications. Its home base was passenger train service, but lightweight fast passenger trains and many a freight train were also among its tasks, which it mastered with bravura. World War II and the division of Germany left behind deep traces in the case of the class 64. The German Federal Railroad acquired 278 locomotives; 115 went to the German State Railroad of East Germany and one locomotive remained in Austria. Like many other classes, the class 64 also acquired a nickname. A modern lady's hairstyle of the time (bobbed hair) was the inspiration for this sturdy, compact locomotive. To what extent this was flattering to the world of women or to the profession of hairstylists is debatable, but to the German Federal Railroad the class 64 was a reliable partner for crews and passengers right up to its retirement in 1974. The museum locomotives that have been preserved enjoy endless popularity.